Moving house to the country? Installing or firing up a wood burner or maybe reviving an old fireplace? It won’t be long then until logs loom large on your Autumn to do list. Logs about the house are synonymous with the warming comfort of the flames of a wood-burning stove or open fire. When it’s damp, dark and cold outside, instant calm comes with the pleasing repetitive ends of clean-cut hardwood. Some create large focal, forestry interiors features from carefully stacked logs in purpose-built alcoves but for those that don’t have the space in the house for stacks and stacks, unwieldy wicker log baskets don’t have to be the only answer! Ever since we introduced handcrafted traditional fireguards to our metalwork mix, word has spread like the proverbial and, along with our recent addition of a more contemporary design of fire guard, we’re now very proud and more than a little excited to introduce a range of ‘best in show’ traditional and contemporary steel log holders. So it’s crisp and white outside. Stamp the frost off and breathe in the sweet smell of a recent stash of well-seasoned logs drying by the fire. There’s nothing like it. When you source your wood, it’s worth the extra legwork to find a local, reputable firewood supplier, providing seasoned hardwoods from FSC managed forests and woodland. For wood burning stoves, order up a delivery of hardwoods, dried for at least a year, preferably two summer seasons. These will burn well, cleanly and for longer as the wood is more dense than softwoods. Avoid tarry coniferous woods which will leave sticky deposits on stove glass and in the flue, increasing the risk of chimney fires. For open fires, well-seasoned hardwood logs are also better because they are less inclined to split, spit and spark. However, some softwoods can be mixed with hard wood here to create a really hot and virtually smokeless open fire. The majority of good suppliers will ensure that your logs are cut to a length that’s best for your particular stove or fire. To cover small log-burners, some will cut as short as 20cm if asked nicely! Make no mistake – these are immensely practical, very well-made objects that can be used ‘for life’, no doubt to be treasured as functional heirlooms of the future. Our new, very sturdy and elegantly designed log holders come in three sizes, forged from fully welded steel, hot dip galvanised and then finished with an aged patina or painted Grey. 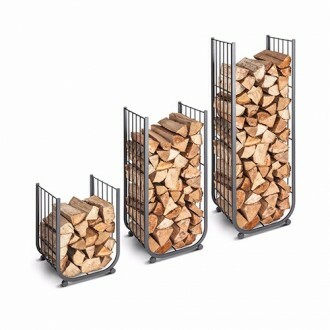 The tallest version is a beauty and a beast in one, holding around a week’s worth of logs, perfect for a small burner. For period, heritage properties, some will lean longingly towards our English wirework traditional log holder, which sits so comfortably alongside our traditional Victorian nursery fireguard design. For more modern environments, our fine, more minimal freestanding contemporary log holder is not only stylish but very solid. Do ask if you’re interested in bespoke colours to match your interiors. We’re thinking that lighter hues would work wonderfully too! Both designs have four cylindrical steel feet to spread the varying log loads and maintain balance. The log holder’s attractive form most definitely follows function, something which pleases our workshop & HQ teams and, we hope, will please you and your future house guests too. Is it too early to be imagining Christmas gatherings around the fire?? Get those mince pies in the oven!